BRING THE UPPER BENCH EXPERIENCE HOME TODAY! Want to be the best gift-giver in the world? A club membership makes an excellent gift! 6 bottles of wine and 3 pieces of perfectly paired cheese sent quarterly plus more! 6 bottles of wine sent quarterly plus more! 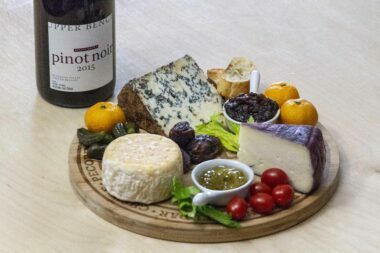 6 bottles of red wine and 3 pieces of perfectly paired cheese sent quarterly plus more! 6 bottles of red wine sent quarterly plus more! Members will receive advanced notice before each shipment (March, June, September, and December). Payments will be processed one to two weeks before each shipment. Taxes and bottle deposit are included in the Club price, shipping is an additional charge. We will send you the delivery companies’ tracking information so you can track your shipment. As it is law, someone (over the age of 19) must sign for all packages containing wine.